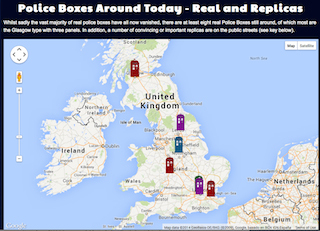 One might not think too much about the historic police boxes that look like American telephone booths that used to dot the UK landscape. Now, only a handful of them are left. Here is a map of all the original ones currently known, as well as replicas of originals. I’m wondering if the renewed interest in this now defunct form of 911 is as a result of the popular “Dr. Who” PBS series, in which the infamous Doctor goes into his “Tardis” which is in fact, a replica of a 1929 police box. That’s where the resemblance ends, however, as the Tardis is “much bigger inside than it is outside” with all forms of technology for fighting evil forces within its four walls.